This frame church, located on the Jefferson Pike just outside Frederick, Maryland, lost its tower and other features when it was converted into apartments about 1950. Does it still exist? 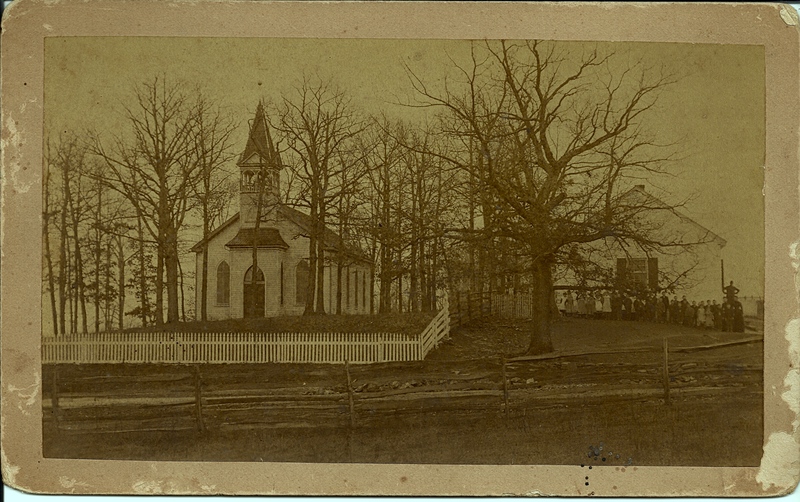 According to the Feagaville Survey District document that was filed in 1980, the church was built in 1880. The building to the right was a stone schoolhouse built ca. 1840-1850; perhaps it had been whitewashed. The hand-drawn map accompanying the survey document locates the church just north of Feagaville Lane. A newer, brick church, surrounded by its cemetery, thrives just a few miles away at Mount Zion and Mount Phillip roads. The history of this church is confusing. The History of Frederick County, Maryland, Volume One, published in 1910, speaks of the church being built 1819, but says it was a stone structure. There is no mention of a frame structure. But, as mentioned above, the 1980 survey says this frame church was built in 1880. The History mentions a new stone church being built on the site in 1885 (p. 503)–but nothing about a brick church. A contemporary photograph taken by Jody Brumage shows a stone above the new church door on Mount Phillip Road with the date 1885.